“Eeyore was saying to himself, “This writing business. Pencils and what-not. Over-rated, if you ask me. Silly stuff. Nothing in it.” — Winnie the Pooh. A long time ago, in a far away place, before apps and texts and even typewriters, pencils were used to convey the written word. As you purchase a new box of Ticonderogas to mark your bubble answer sheet, consider the invention of the pencil. Pencils are made with graphite. Therefore, graphite mining had to exist before the pencil was created. The first graphite was mined at Seathwaite Fell in Cumbria, England in 1564. Since graphite has similar properties to lead, it was first called, “plumbago,” derived from the Latin word for lead ore. The first pencils were produced by sawing the graphite into sheets, shaping the graphite sheets into square rods, and inserting the graphite rods into a wood casement. However, the first pencils were fragile because the graphite broke easily. To prevent the graphite from breaking, French chemist, Nicolas-Jacques Conté, discovered the process of mixing the graphite with clay. The soft material was pressed into sticks and kiln-fired. At which point, the dry graphite & clay rod was inserted into a wooden case. By varying the ratio of graphite to clay, Conté discovered that he could manufacture a pencil for a specific hardness to differentiate the marks on paper. For example, No.2 pencils are popular because of its midrange hardness which leaves dark marks without smudging. No.1 is the softest graphite and leaves a darker, smudgier mark , and No.3 pencils leave a fainter mark. Conté’s 1795 patent is the basic process for manufacturing pencils today. To learn more about the manufacturing of pencils, watch this video from the Science Channel, How It’s Made : Pencils. A. What chemical is graphite composed of? B. 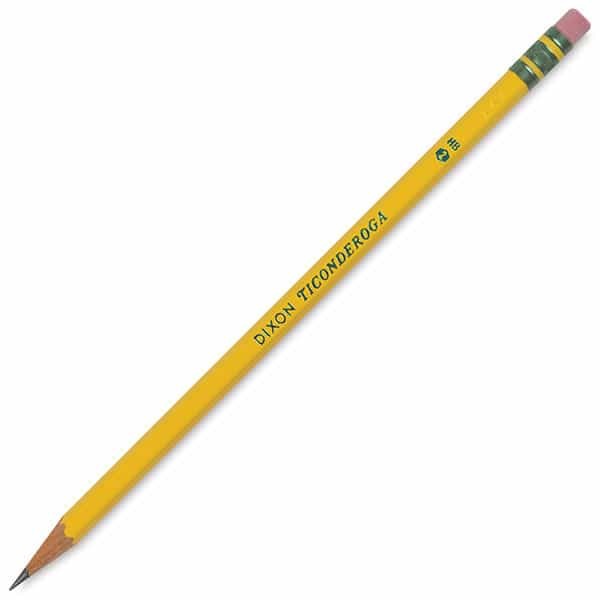 What television personality regularly played with specially made pencils with erasers at both ends? C. Which inventor had his pencils specially designed to be three inches long with abnormally soft graphite? D. Who received the first patent for attaching an eraser to the end of a pencil? E. The majority of pencils manufactured in the United States are what color? F. How long is the Guinness Book of Work Records largest pencil? National Day Calendar: National Pencil Day, March 30. 2015. Wikipedia: Pencil. March 26, 2015. A. It is made almost entirely of carbon atoms.